As part of the company’s charitable and philanthropic efforts, a $5 donation was given to a local nonprofit organization for each visitor who registered with a sales consultant during David Weekley Homes World’s Largest Showcase of Homes, amounting to more than $45,000 for 18 local charities. In Houston, more than $10,000 was donated to Ronald McDonald House Houston. "I thought I knew strength, and then I saw the families at Ronald McDonald House,” said Amanda McLain, a project coordinator David Weekley Homes. “I learned that you don’t need hair to rock an awesome hairdo thanks to wigs and stickers and it made my heart smile. Those families are dealing with more than we can imagine and something as small as having a single meal prepared for them takes one thing off their to do list, and I am grateful we get to do that for them. We create homes and enhance people’s lives, but I like to think Ronald McDonald House Houston does the same thing because in the walls of that building, of that home, all of them, the staff, the patients, the parents and siblings, they are all family, and for a little bit, we got to be a part of it." For more information about David Weekley Homes in Houston, visit www.davidweekleyhomes.com. 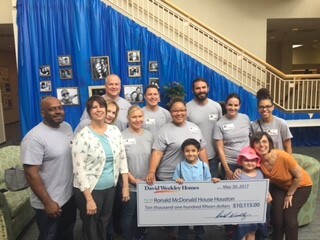 Team Members from David Weekley Homes presented a check for more than $10,000 to Ronald McDonald House Houston following the builder’s World’s Largest Showcase of Homes event.